The first quarter of the year was strategically important and eventful for Monobank. The merger with BRAbank and equity raise will solve the need for additional equity capital. Furthermore, the quarter saw positive operational and financial development with continued growth in net loans and interest income. Overall, first quarter loans and advances to customers increased 7.6 per cent to NOK 3 988 million (from 3 706 million in Q4’18) excluding provision for loan losses and prepaid agency commissions. Net interest income for the quarter was NOK 100.2 million, an increase of 5.4 per cent compared to the previous quarter (95.1 million). 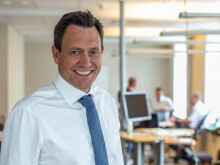 Net profit after tax ended at NOK 16.1 million and the return on equity was 10.1 per cent. The proposed merger with BRAbank was approved by the AGM on 20 March. 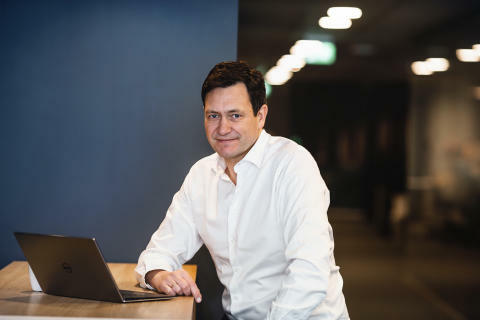 The transaction will create a well-capitalized and well-positioned bank with significant growth ambitions in the Nordic consumer finance market and exploit the significant scalability in Monobank’s business model. The multi country platform that was connected to the deposit provider Raisin in the first quarter 2018 was expanded to Sweden this quarter as Monobank successfully launched its consumer lending activities in the Country. The expansion fits well with BRAbank’s current presence in the Swedish consumer credits market. 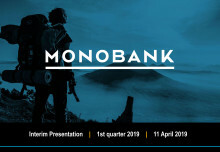 “It has been a very exiting quarter for Monobank and a strong foundation has been laid for a positive development going forward. The proposed merger with BRAbank will solve our need for additional capital and we are now fully financed to reach our ambitious financial targets. We continue to deliver on our growth strategy and our entrance into Sweden has been successful”, says Bent Gjendem, CEO of Monobank ASA. The company will host a presentation of 1st quarter 2019 results in Oslo Thursday 11 April at 11:00 AM CEST at Felix Conference Center, Bryggetorget 3, 0250 Oslo. 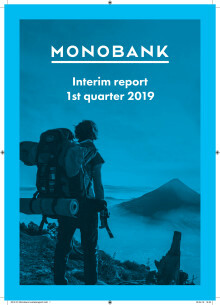 The first quarter report and presentation will also be made available on www.monobank.no/ir and www.newsweb.no. Monobank ASA er en heldigital bank som tilbyr Personlån, høyrentekonto og kredittkort. Monobank har et sterkt fokus på kundetilfredshet og fintech-løsninger. Banken ble etablert i Bergen i november 2015 med konsesjon fra Finanstilsynet, og lanserte i Finland i 2017 og Sverige i 2019. Banken er medlem av Bankenes Sikringsfond, noe som innebærer at alle bankinnskudd inntil to millioner kroner er dekket av innskuddsgarantien fra sikringsfondet.